Research shows that 52% of bearing failures are due to contamination of the bearing oil*. * Bloch, Heinz; “Pump Users Handbook: Life Extension” 2011. Save your bearings and improve your reliability with our bearing isolation / protection range. Reliability by numbers: 52% of bearing failures. A study into equipment reliability conducted at a major refinery has published statistics on causes of equipment failure. They concluded that 40% of overall rotating equipment failures (pumps, mixers, etc) were due to bearing failure. They further estimated that 48% of all bearing failures were due to particle contamination and a further 4% were due to corrosion (caused by liquid in the oil). 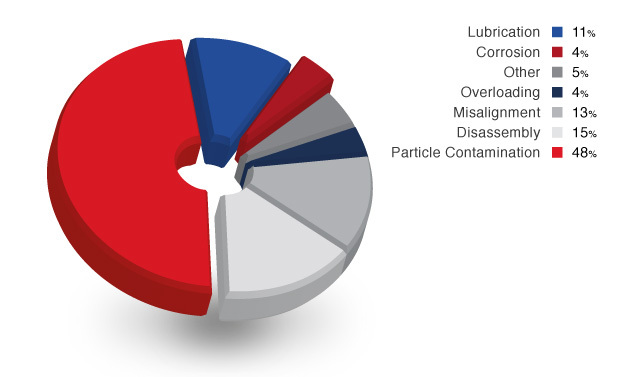 Therefore 52% (total contamination cause) of 40% (bearing failures) = 20.8% of all rotating equipment failures are caused by contamination of the bearing oil. Use the Bearing Protection navigation menu to filter through the product range, or take a look at some of our featured products below. The LabTecta®M is specifically designed for use on electric motors. Advanced cost effective labyrinth seal, specifically designed for top-entry applications. A cost effective bearing protection upgrade solution, which is non repairable. Engineered Bearing Protection for use with tilting pad bearings. Eliminate over 50% of bearing failures with the LabTecta® IP66 certified bearing protector: a true non-contacting labyrinth design with a shut-off design that really works. The LabTecta-AX™ design uses a unique sliding rotor that allows the seal to absorb axial movement internally. The LabTecta-IAP™ design is ideal for applications where it is necessary to retain product, gases or exhaust within an enclosure. Common applications are fans, screw conveyors and other powder handling equipment.